Guitarist Robbie Krieger and drummer John Densmore of The Doors will reunite later this year to pay tribute to keyboardist Ray Manzarek, who passed away May 20 after a lengthy battle with bile duct cancer. "We're going to do at least one show for Ray and have a big send-off," Krieger tells Rolling Stone. "That's either the start or the end of it, I don't know." A serious rift with Densmore erupted after Krieger and Manzarek began touring in 2002 as the Doors Of The 21st Century, leading to a lawsuit over the use of the Doors name, and a $40 million countersuit against Densmore for his refusal to sign off on multi-million-dollar licensing of band songs for commercials. "That's what you do – if someone sues you, you sue them twice as hard back and hope that they drop the suit," Krieger said. "It was a very stupid idea. We had the worst lawyers." 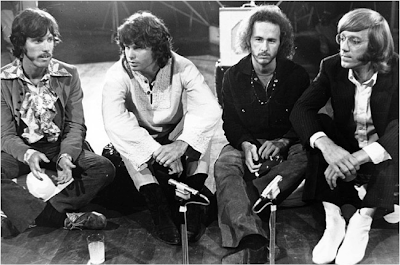 That battle is long behind them now, though it's the subject of Densmore's new book, “The Doors Unhinged.” Krieger said he's read "about half" of the sometimes angry book. "We should probably wait until John's book dies down," said Krieger. "He's the one that got me in the Doors. What am I going to do? I can't hate him forever. I just wish he had wanted to play with Ray and I back before all this started. That's when things went bad. We're talking about it." "He had a good run," Krieger said, noting Manzarek's 74 years at the time of his death from cancer in May. "For a rock & roller, that's a pretty good age."